Thanks to Concept, you no longer need to talk in order to communicate. By combining universal icons, you can get other to guess hundreds of objects, titles and characters. 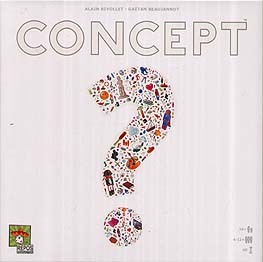 Great game to play with large groups, like charades but with a board of images/concepts to use! This is a simple game using cubes and markers which are placed against images/symbols on a large board for others to see. A main marker signifies the main concept you are trying to get across, for example a historical figure or a book or a film. Then smaller cubes are used to give secondary clues. The game is simple enough for everyone to get in on the fun and you don't even have to score the rounds, (or even use the supplied cue cards!) as it is fun enough just to do as an activity while you wait for a group to assemble, or if people don't want to get into a heavy or competitive game. We ended up trying to outline our favourite movie quotes! Awesome fun. I strongly recommend this game for a fun evening with a mix of gamers/non-gamers alike.